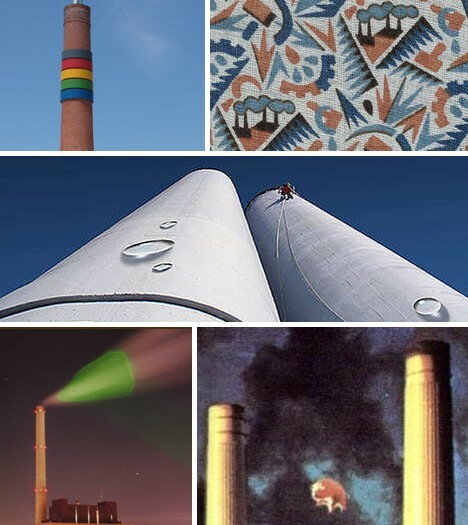 Once soaring symbols of the Industrial Revolution and material progress, smokestacks later became the poster kids of environmental degradation. 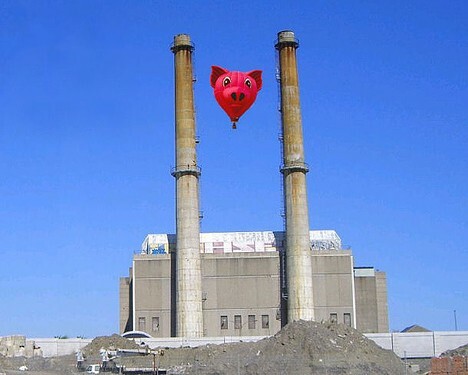 Today, legions of artists, urban planners and preservationists are seeking to change those carbon chugging chimneys from sooty to beauty. 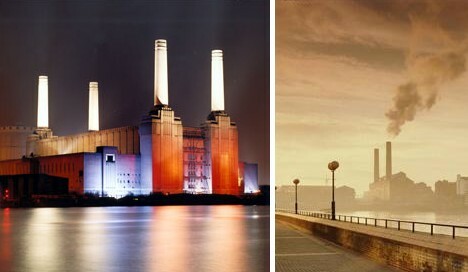 London’s iconic Battersea Power Station with its quartet of ivory white smokestacks was designed by architect Sir Giles Gilbert Scott and was built in 2 stages between 1930 and the mid-1950s. The huge coal-fired station is a classic example of Art Deco design but most know it from its prominent place on the cover of Pink Floyd’s 1977 album, Animals. 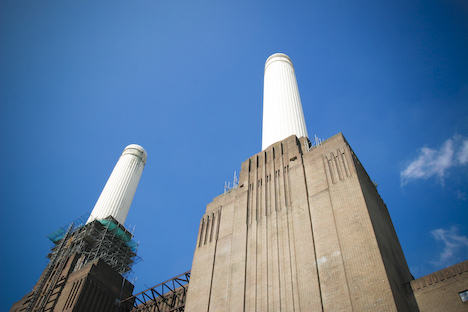 Battersea ceased operations in 1983 and has been slowly decaying since then, though it remains protected as a Grade II* listed building. Numerous proposals have been floated to rework and reuse the station while retaining its unique 4-stack structure but as yet none have gone beyond artistic impressions. 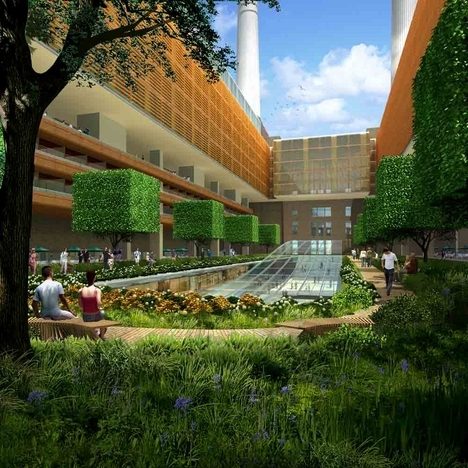 Call it greenwashing if you like, but the twin 155-meter (510 ft) smokestacks at a suburban Paris heating plant certainly do look cleaner after artist Frederic Gracia gave them the trompe-l’oeil treatment. The largest faux water drops measure 1.1 meters (3.6 feet) in diameter and were painted on by Gracia himself. 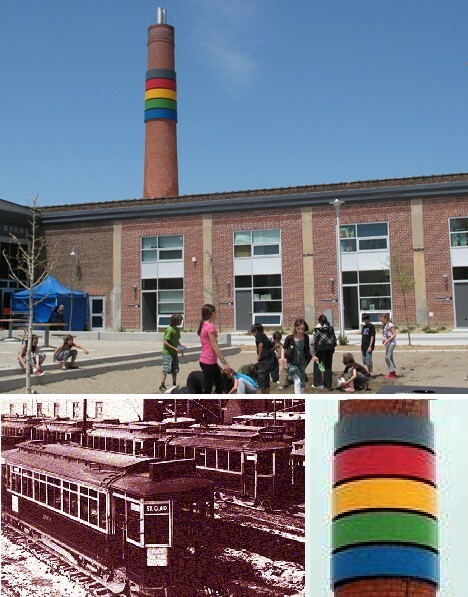 When the City of Toronto decided to renovate and remodel the circa 1913 Wychwood Car Barns into a public housing project, one particular architectural feature loomed over all design considerations: the smokestack. 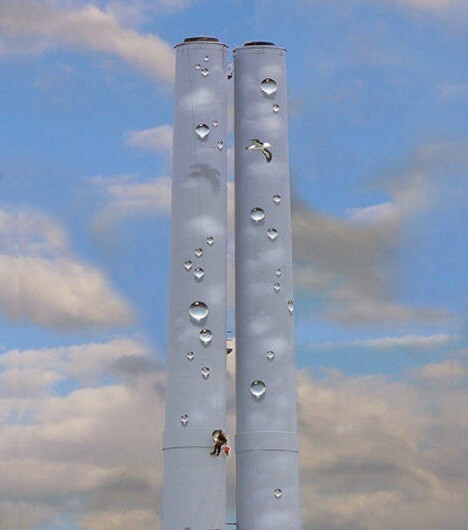 The easiest way to deal with the “problem” was to demolish it but, thankfully, architect Joe Lobko of du Toit Allsop Hillier and Tim Jones of Artscape integrated the towering symbol of industry into the residential development. In contrast to the area’s gritty past as a public transit maintenance yard, the new community uses geothermal heating & cooling, recycled rainwater and high efficiency lighting. The Des Carrières incinerator was built in the 1970s but has been standing empty and unused since 1993. 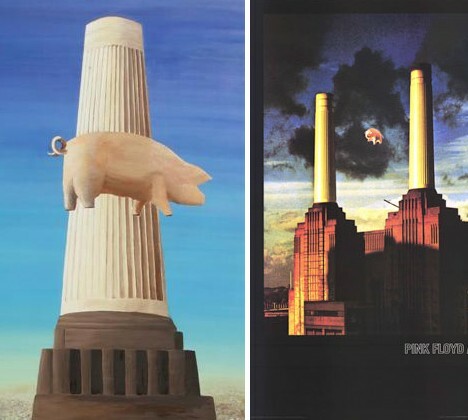 The “Version Festival of Balloons by Michel” is meant to evoke the previously mentioned Pink Floyd “Animals” album cover but without the ruckus that ensued when Floyd’s pink pig broke away from its moorings and drifted across southern England. 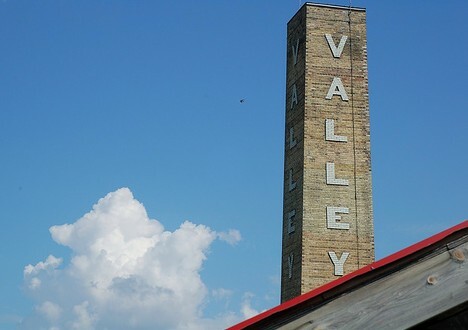 According to a contributor to the Pentax Forums’ Project Urban Decay, “This is the smoke stack of the former Canada Packers Plant in the old side of Edmonton. 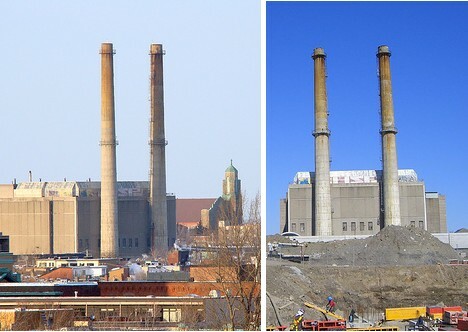 Most of the building was demolished in 1995 and a local architect who owned the land at the time saved this smoke stack from destruction. Nothing has been done to the land since, while development flourished all around it. Weird!” Indeed – but weirdly beautiful as well. The clash of the modernistic green graffiti and the weather-worn brickwork of the lone stack makes an incongruously intriguing combination. 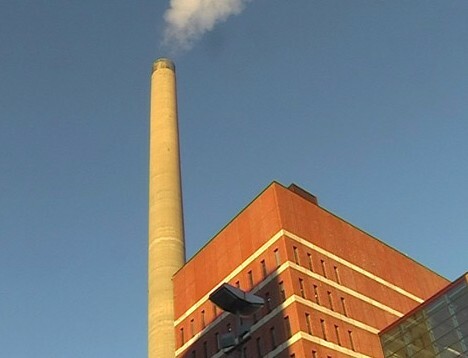 By day, the smokestack at the Salmisaari power generation substation in Helsinki, Finland, looks like most any other power plant stack accompanied by a cloud of spewed emissions. 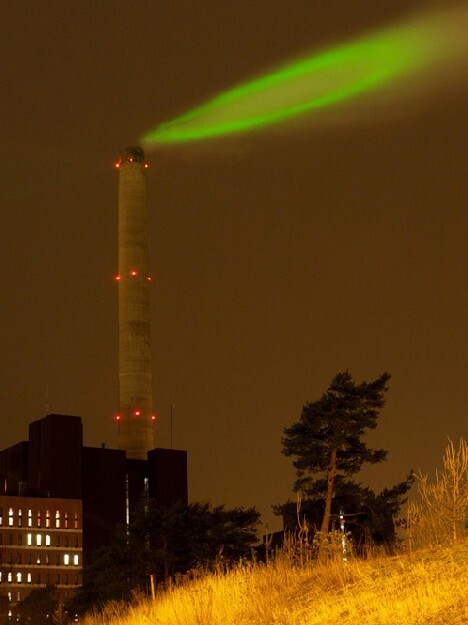 By night things are different – a green laser beam lights up the emissions cloud. This is more than just an art installation, however. 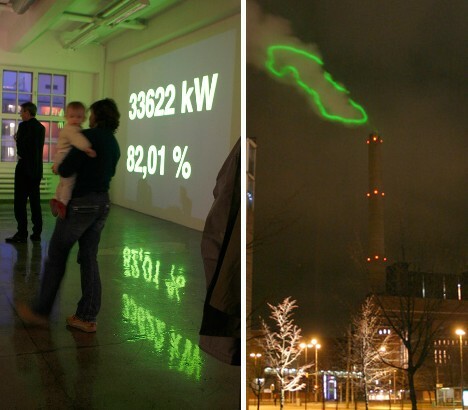 By adjusting the laser, the operators at Nuage Vert (Green Cloud) in effect created a highly visible power meter that displayed Helsinki’s energy consumption – the less wattage consumed, the bigger the green cloud. 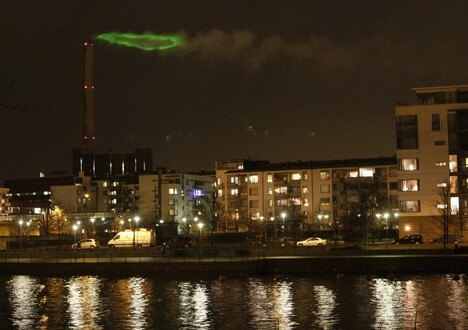 Even more interesting, the public actively began to monitor their power usage in an effort to affect changes in the size of the green-lit cloud. 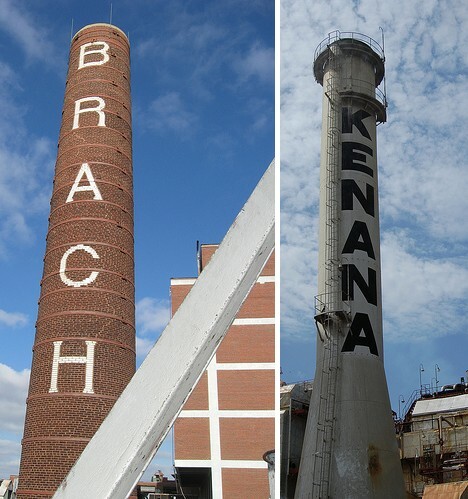 Many older smokestacks bear the names of the factories they served, in some cases formed from bricks of a contrasting color. The permanence of these factory names sometimes leads to the unexpected consequences of surviving stacks still shouting out their names long after the original company and factory has faded into corporate history. 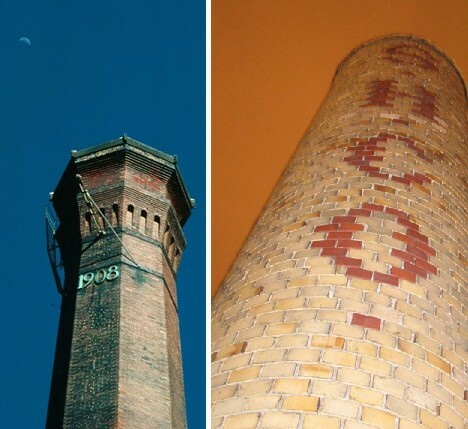 Smokestack art and imagery isn’t as uncommon as one might think. 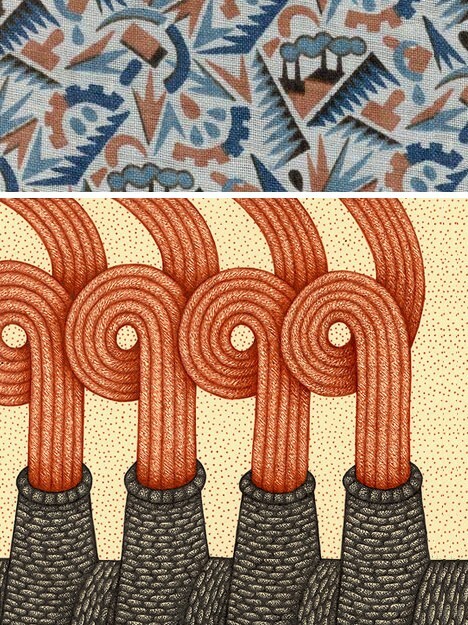 The topmost of the above examples is a sample of Soviet textile art from the period 1927 through 1933, when it was banned by the USSR’s leadership. 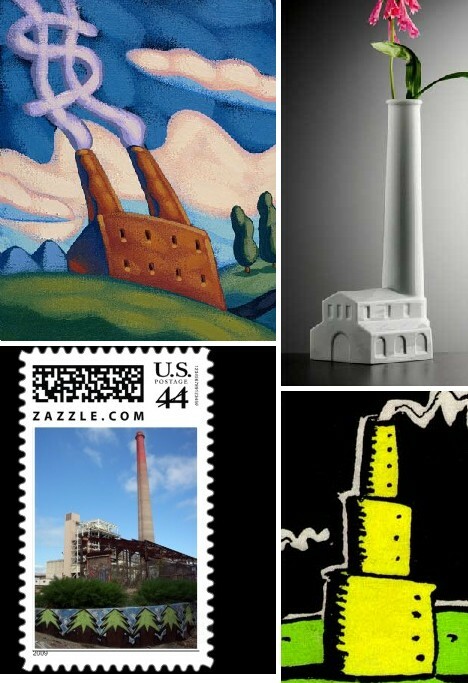 The lower example, titled “Smokestack Song”, is a pen & paper work by artist Valerie Lueth dating from 2007. 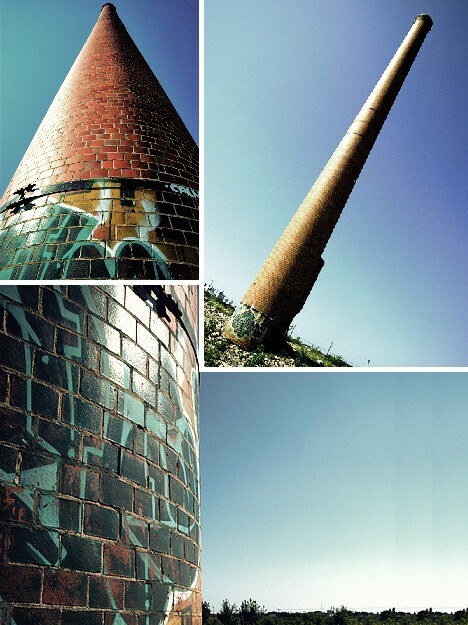 Smokestacks can be the stars of the show as well, not just a bit player in a larger pattern. The white porcelain Factory Vase above is Maxim Velcovsky’s ironic comment on industrialism. One wonders if Velcovsky wasn’t influenced, if not outright inspired, by scenes of sixties flower-power protests where hippies placed blooms into the barrels of National Guardsmen’s guns. 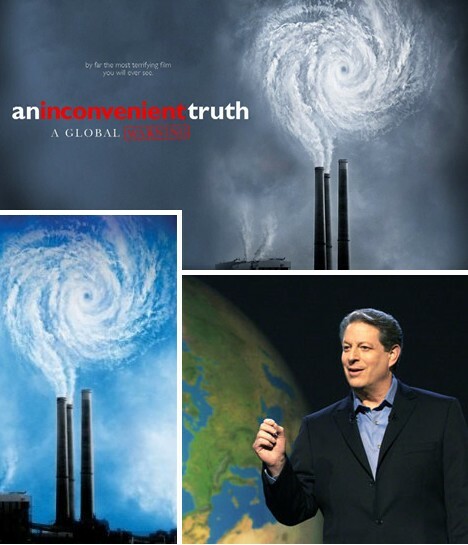 So closely are smokestacks identified with air pollution on a grand scale, Al Gore figured it was a no-brainer to put them front & center on posters for his global warming clarion call, An Inconvenient Truth. The poster features emissions from industrial smokestacks coalescing to form the familiar spiral of a hurricane. Al Gore may be many things but subtle isn’t one of them. What say ye, is the deck stacked against the world’s towers of industrial power? Even the name “smokestack” reeks of throat-searing particulate clouds and eye-watering emissions. 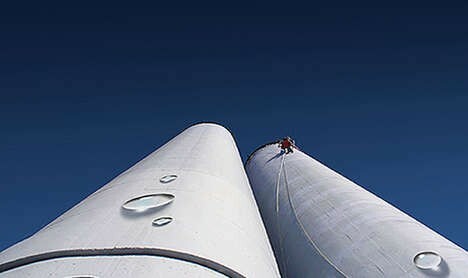 And yet, these chimneys symbolize society’s leap from rural to urban, from agricultural to technological. They are a part of Us – and along with Us, embody the potential for rehabilitation and redemption.